Do examinations and treatments always have to be booked? Examinations, yes. All treatments, except inhalation treatments. This is to ensure you are not kept waiting and guarantee you have a place at the time desired. How much in advance is it advisable to book? The earlier the booking is made, the more time slots will be available. For the mud bath therapy, at least a month in advance is advisable, less for all the others. Can I receive the treatments without an examination? No, only massages do not require an examination. What happens if the prescription isn’t filled in correctly? If the doctor’s prescription has not been filled in correctly, Terme di Sirmione cannot in any way amend or supplement it. The original prescription must therefore be presented again with the necessary corrections and/or supplements. Alternatively, with a €75 deposit, the treatment can be undertaken by sending the corrected prescription by fax or email in advance, ensuring the original is received within three days from the start of the treatments. What should I do if I only have a prescription from a specialist doctor (not NHS)? If you present the prescription of a specialist doctor (issued within the previous 60 days), a meeting with the specialist doctor at the facility will be sufficient, and a treatment plan will be drawn up (€55 fee). Why is a complete check-up recommended? The most common diseases are often linked and therefore required the contribution of several specialists, examinations and complete treatment programmes. The check-ups and programmes offered enable diseases and disorders to be diagnosed and treated in a more personalised and complete way. If your booking is at the Terme Catullo, you should go to the historic centre of Sirmione, if the booking is at the Terme Virgilio, you should go to Colombare di Sirmione. What treatments can I find at Terme di Sirmione? Once, the spa only provided inhalation and mud treatments but now there are many new services. The sulphurous water with bromide and iodide salts has many therapeutic properties that affect the whole body. Are spas only for the elderly? No, its action is beneficial for all, including children. What must I do when I arrive at the facility? 1. The first step is to go to Reception, where the booking, personal details and any prescription will be checked. In the case of a private examination, payment must now be made. 2. The next step is the examination at the clinic. 3. Finally, return to the cash desk to pay for any treatments and/or tickets. What should I bring for the mud bath therapy? Bathrobe and slippers. Bathrobes can be hired at Reception or purchased at our Store. For all clients of Terme Virgilio, a free indoor car park is available. What must I do every day during the treatment cycle? To access the treatments, you should always carry your personal card and doctor’s prescription with you to display to the operator. The card is issued on acceptance, subject to a deposit of €5, together with an envelope in which to keep it safe. Bars are available at all our facilities for clients and patients, offering food during the day. Why are two thermal treatment cycles a year recommended? Clinical trials demonstrate that two cycles of thermal treatments a year with an interval of six months between them allow long-lasting benefits to be obtained, along with a highly effective preventive function against chronic diseases of the upper and lower airways. Will my child be bored undergoing the treatments? No, because the department is made to measure for the little ones. It is furnished with games, colours and a TV for entertainment during breaks between one treatment and another; moreover, outside, a fine playground is available for the children. Can I buy Sirmione water? Yes, it’s on sale in the store, together with many gifts for the whole family: the mascot Procopio for children and the Aquaria Thermal Cosmetics line for adults. Around 10 minutes each for the inhalation treatments, plus 10 minute breaks between each one. Allow 1 hour in all for the mud bath therapy. For the massages and the other treatments, information on the duration is given at the booking or examination phase and at Reception. What should I do if I can can’t come to undergo the treatment? Notice should be given on the day. 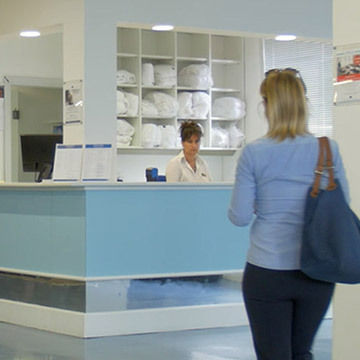 In the event of absence from the centre for two consecutive days without notice, Terme di Sirmione can cancel the entire treatment cycle. What happens if I suspend the treatments? If you are obliged to suspend the treatments for personal reasons for a maximum period of 60 days, following a written declaration, you may complete the programme. In the event of health problems, a free readmission examination will be required. If the treatments are suspended for more than 60 days, the examination must be repeated (€65) while the treatments already purchased remain valid. Post a review on TripAdvisor with your opinion on your thermal experience. Our objective is to always improve and every suggestion is important to us. Did you come for a specific reason and did you find out that we treat other conditions? Terme di Sirmione offers a 15% discount on the second treatment cycle, if undertaken within the same calendar year. A 15% discount is also given on the purchase of 2 programmes, not under agreement with the NHS, and is applied on the least expensive of the two.